Primary texts about Prayer and Piety from Dr Mahlon H Smith's Into His Own: Perspective on the World of Jesus (Rutgers University). See esp "Hanina Stills A Storm." "They that sail with Christ, although he seems to sleep ever so soundly when they are in danger, yet they are preserved by him in due time, being awakened." "Christ was asleep in the storm, to try the faith of his disciples, and to stir them up to pray." "On the pillow - So we translate it, for want of a proper English expression, for that particular part of the vessel near the rudder, on which he lay." "There is a natural apprehension under danger; but there was unbelief in their fear. It is worthy of notice how considerately the Lord defers this rebuke till He had first removed the danger, in the midst of which they would not have been in a state to listen to anything." "Such an astounding display of power, the control of the storm in which men are as helpless as infants, filled them with awe." Commentary, Mark 4:35-41, James Boyce, Preaching This Week, WorkingPreacher.org, 2015. "Perhaps in the shaping of that journey the power and presence of the good news of God's kingdom will shape our lives in the crucial turn from fear to faith." "On Miracles and Change," David Lose, ...in the meantime, 2015. "Do you think the disciples were more frightened before the stilling of the storm or after?" "The Other Side," Karoline Lewis, Dear Working Preacher, 2015. "The hardest thing is getting into the boat. You just have to get into the darn boat." "Peity and Panic," D Mark Davis, Left Behind and Loving It, 2015. "I think perhaps we ought to imagine ourselves and our entire congregation in an airplane that has lost its engines when we preach this text. Then we can explore panic and pious together." "When God Sleeps through Storms," David R. Henson, 2015. "Unharbored," Journey to Penuel, 2015. "An Exercise of Authority," Thomas Beam, 2015. "Is Jesus Calling Us To Be Superheroes?" Bruce Maples, 2015. "Jesus didn't expect them to stand steely-jawed and silent in the face of the storm. He simply expected them to manage their fear by knowing that he was there, and that he was able, and that he would act." "Bible Leads," Deeply Plaid, 2015. "Power Over a Storm," Janet H. Hunt, Dancing with the Word, 2015. "Is this a directive for us to stand firm and keep believing in the midst of all the storms we inevitably face? Yes, be smart. Do take cover. But panic is not ever faith-full. Bowing to our terror most likely will only make things worse." "Don't You Even Care?" Casey FitzGerald, Faith & Wonder. "Fear Factor," CaseyFitzgerald tells the story of David & Goliath and Jesus Calming the Storm, 2015. Knickers in a Twist, video telling of Mark 4, inclusivechrist, 2015. When Storms Rage, Bartimaeus Effect, 2015. "A Night to Remember," Glenn Monson, Law & Gospel Everywhere, 2015. "Stilling Fear," Alan Brehm, The Waking Dreamer. "We say we believe God is a God of love, and that God loves us unconditionally. But the real challenge is to entrust ourselves into the care of this loving God—especially when we're afraid. The only way to do this is to let go whatever it is we're afraid to lose. If the essence of fear is trying to control, the essence of faith is letting go." Commentary, Mark 4:35-41, Meda Stamper, Preaching This Week, WorkingPreacher.org, 2012. "Crossing to the other side with Jesus may be a risky, unpredictable proposition, and in this passage, the wind and the sea create a visual manifestation of the dangers of being in the boat with him." "Calming the Storm," Frederick Buechner, Peculiar Treasures. "Avast ye scurvy elements!" D Mark Davis, raw translation and exegesis/questions, Left Behind and Loving It, 2012. "Faith and Fear," David Lose, Dear Working Preacher, 2012. "What are you afraid of? I ask that because I have a hunch that we're rarely aware of just how significant a role fear plays in many of our decisions, actions, and conversations." "Lord of the Storm," Greg Carey, ON Scripture, Odyssey Networks, 2012. "Shifting the focus from the disciples and their struggles to Jesus and his authority makes for good news." "Who Is Your John the Baptist?" Janet Hunt, Dancing with the Word, 2012. "The Calming Slumber of Jesus in Our Storms," Rev John Henson, 2012. "Most everyone has found themselves, at one time or another, in the unpredictable squall of a lifetime, experiencing the swamping of overwhelming waves." "And Behold there Came a Great...SMILE!" Peter Woods, I Am Listening, 2012. 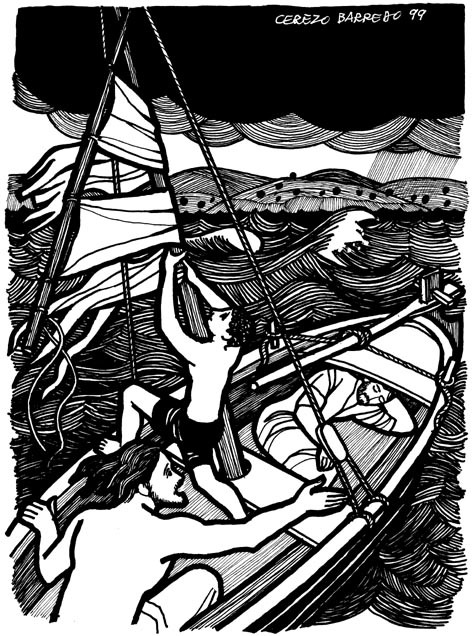 "Choppy Seas, Calm Spirits," Alyce McKenzie, Edgy Exegesis, 2012. "People who think of the sea as a scenic view from the boardwalk as they slurp their snow cones don't understand where Mark is coming from in characterizing the sea. People who have been through a hurricane or a tsunami, however, get it." "Raging in Fear," Rick Morley, 2012. "Stormy Seas!" Peter Lockhart, A Different Heresy, 2012. "We are called to share in his work, not just make padded seats for the boat so the ride can remain smooth." "Bailing Buckets," Mike Baughman, The Hardest Question, 2012. "Sometimes Jesus just gets grouchy." Jesus Calms a Windstorm, audio telling, story in episodes, graphic, audio and written commentaries. Go Tell Communications, Biblical Storytelling for the Global Village, 2012. Commentary, Mark 4:35-41, Sharon H. Ringe, Preaching This Week, WorkingPreacher.org, 2009. "Even when the seas threaten to engulf us and human imperial posturing threatens our home and the heart of our identity, the Risen One is always in the boat with us. Christ's words, 'Peace! Be still!' still promise to carry us safely through the night." "Jesus Stills a Storm," Michael A. Turton's Historical Commentary on the Gospel of Mark, "a complete verse-by-verse commentary on the Gospel of Mark, focusing on the historicity of people, places, events, and sayings in the world of the Gospel of Mark." Exegetical Notes by Brian Stoffregen at CrossMarks. "While we may pray that Jesus would work miracles in our lives and in our world and in our neighborhoods; the miracles that come probably won't let us off the hook from doing some of the hard work required to do what Jesus has called us to do." "First Thoughts on Year B Gospel Passages in the Lectionary," Pentecost 4. William Loader, Murdoch University, Uniting Church in Australia. "People know what it is like to be buffeted. People know what it is like to have no control. People know situations where only the divine can intervene." "Jesus Calms the Storm," Rev. Bryan Findlayson, Lectionary Bible Studies and Sermons, Pumpkin Cottage Ministry Resources. Includes detailed textual notes. "Stilling the Storm," Gospel Analysis, Sermons from Seattle, Pastor Edward F. Markquart, Grace Lutheran Church, Seattle, Washington. Detailed background and exegesis. Join the Feast, Mark 4:35-41, Berry French and Clark Scalera, Union PSCE, 2009. "The storms, coupled with the Gospel?s eventual spread into socially and religiously unclean lands, give me perspective on how we are called to have faith and share faith across boundaries ? boundaries that may challenge or even offend our religious institutions." "Storm System," Michael A. King, The Christian Century, 2006. "Gilbert helps me suspect anew that the power of the psychological immune system we spy through the lens of cognitive science may be only the first level of what we may glimpse if we open ourselves to the resources that Mark and Paul tell us come from beyond." Wellspring of the Gospel, Ordinary 12B, Catherine McElhinney and Kathryn Turner, Weekly Wellsprings. "God is a Peacemaker (Mark 4:35-41)," John C. Purdy. Chapter 7 of God With a Human Face (1993), republished at Religion Online. "Both the storm and the fears of the disciples are calmed by the words of Jesus. Stormstiller is Peacemaker. In the context of this book, that means that God also is Peacemaker. God cares whether or not the human enterprise perishes. God works in mysterious ways to bring peace. The storm clouds above our heads are rich with mercy." "Mark 4: Rebuking the Wind and Waves," wikipedia. "Magic, Miracles, and The Gospel," L. Michael White. PBS From Jesus to Christ. "Probably in some ways, and more than any other issue within the development of early Christianity and the gospels tradition, miracles present one of the problematic areas." "Hearing Is Believing," James R. Edwards, (other resources at) "Parables," Christian Reflection, The Center for Christian Ethics at Baylor University, 2006. "Jesus? parables cannot be understood by standing apart from them with arms folded in neutral objectivity. They can only be understood by 'entering' into them, allowing their stories to lay claim on us. How do we drop our guard so parables may have their intended effect? The answer, repeated throughout Mark 4, is that we enter parables by hearing." "Homer or Not Homer? Mark 4:35-41 in Recent Study," Douglas W. Geyer. "...a reader may wonder how it is that so many similarities exist between Homer and Mark, but then also use that observation to better develop a meaning of one or the other stories." "Questions, Chreai, and Challenges to Honor. The Interface of Rhetoric and Culture in Mark's Gospel." Jerome H. Neyrey, Catholic Biblical Quarterly 60 (1998):657-81. "In terms of rhetorical background, our survey of "questions" indicates that how they function more often than not as competitive, even hostile weapons intended to inflict major damage. Questions score points, draw blood, and shame opponents. The same interpretation applies equally to the phenomenon of answering a question with a counter-question, which also is an aggressive weapon. And by observing who is reduced to silence, we have narrative clues about who triumphed in the question game and who lost." "'Unanswered' Prayer," Kenneth W. Collins. At Ken Collins' Web Site. and dont be distraught when the ceiling echoes back only your own voice, and you sit there hollow and in tears." Ambrozic, Aloysius Matthew, Cardinal, "Mark's Concept of the Parable: Mark 4:11f in the Context of the Second Gospel," The Catholic Biblical Quarterly, 1967. Blomberg, Craig L., "New Testament Miracles and Higher Criticism: Climbing Up the Slippery Slope," Journal of the Evangelical Theological Society, 1984. Button-Harrison, Tim, "Walking on Water: Mark 4:35-41, Matthew 14:22-32," Brethren Life and Thought, 2007. Callahan, Jim, "Weatherproof," The Christian Century, 2000. Hoffman, Kathryn Vitalis, and Mark Vitalis Hoffman, "Texts in Context: Question Marks and Turning Points: Following the Gospel of Mark to Surprising Places," Word & World, 2006. King, Michael A., "Storm System," The Christian Century, 2006. Layzer, Kate, "Living by the Word: Mark 4:35-41," The Christian Century, 2009. McInerny, William F., "An Unresolved Question in the Gospel Called Mark: 'Who Is This Whom Even Wind and Sea Obey?'" Perspectives in Religious Studies, 1996. Petersen, Norman R., "The Composition of Mark 4:1-8:26," Harvard Theological Review, 1980. Watson, Francis, "The Social Function of Mark's Secrecy Theme," Journal for the Study of the New Testament, 1985. Wink, Walter, "The Projector Is Running," The Christian Century, 1994. "We of Little Faith," Stephen McKinney-Whitaker (PCUSA), Day 1, 2015. "Does Jesus Care?" the Rev. Dr. Lewis Galloway, Day 1, 2012. "The Weakness in Virtue, the Virtue in Weakness," J. Warren Smith, Faith and Leadership, 2010. "The Sleeping Jesus," the Rev. Sarah Jackson Shelton, Day 1, 2009. "A Word for the Wind and the Waves," the Rev. Julie Pennington-Russell, Day 1, 2008. "Tornado Time," Sermons from Seattle, Pastor Edward F. Markquart, Grace Lutheran Church, Seattle, Washington. Pentecost 3, 25 June 2006, Luke Bouman, Göttinger Predigten im Internet: Every Sunday Sermons based on the RCL by a team of Lutheran theologians/ pastors. "In Over Our Heads," the Rev. Dr. Stephanie Weiner, Day 1, 2003. "The Danger in the Water," the Rev. Dr. Ted Wardlaw, Day 1, 1997. "Whose Life Is It?" the Rev. Dr. Francis H. Wade, Day 1, 1997. Worshiping with Children, Proper 7B, Including children in the congregation's worship, using the Revised Common Lectionary, Carolyn C. Brown, 2015. 2012. "Storypath Lectionary Links: Connecting Children's Literature with our Faith Story," June 14, 2015, Union Presbyterian Seminary. 2012. "Peace, Be Still," Charles Kirkpatrick, Sermons4kids.com. "Jesus Tells the Storm to Be Quiet," Sunday School Lessons: Family Bible Study, art projects, music, stories, etc. "The Tempest," Jim Kerlin, childrensermons.com. "Mark 3 & 4 Word Search," Don Crownover's Bible Puzzles. Even the Wind and the Sea, Martha Spong, participatory reading of Mark 4:35-41, Reflectionary, 2012. Clip Art Images: Mark 4:35-41, Misioneros Del Sagrado Corazón en el Perú. Mark 4:35-41, at Cerezo Barredo's weekly gospel illustration. Liberation emphasis. Clip Art: Jesus Asleep During the Storm, Julius Schnoor von Carolsfeld woodcuts, World Mission Collection, Wisconsin Evangelical Lutheran Synod. PowerPoint Slidees for Proper 7B, Bulletin Art for Proper 7B, Bulletin Art for Proper 7B (2), Will Humes, Word & Table, 2009. Commercial Site: Jesus Calms the Storm, (Film/Visual Liturgy), The Work of the People. God, Who Made Each Great Wide Ocean, Carolyn Winfrey Gillette’s hymn inspired by water-related stories in the Bible (creation, Noah, Moses and Jesus) including Mark 4:35-41: "Frightened by a storm they called him, 'Master, will you let us drown?' In that boat there, Jesus awed them; he said 'Peace!' The winds calmed down." Tune: BEACH SPRING 8.7.8.7 D (“God Whose Giving Knows No Ending”). Hymns with Scripture Allusions: Mark 4:37, 38, 39, 40. The Cyber Hymnal.